It’s been a big couple of days for the Littlest Brewster and her mouth! 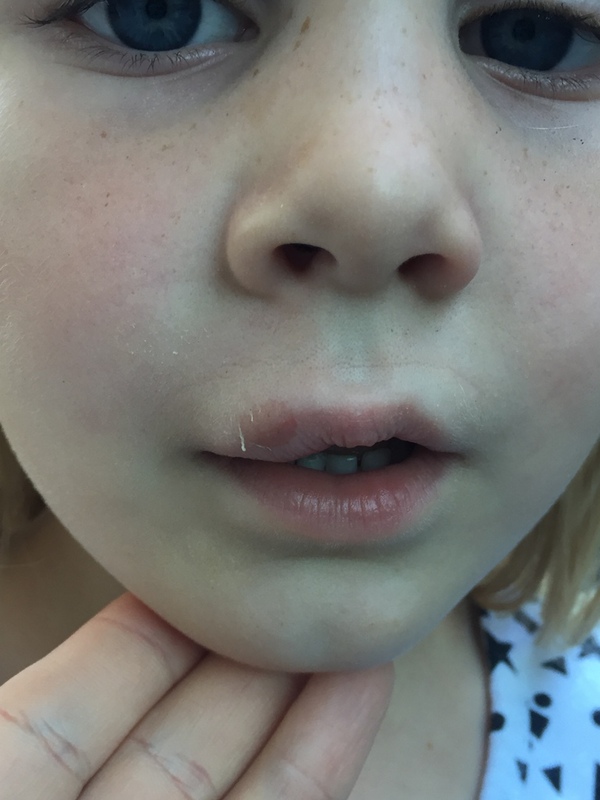 When I picked her up from school on Friday, the poor thing had gotten into a fight with the monkey bars and definitely come out on the losing side. 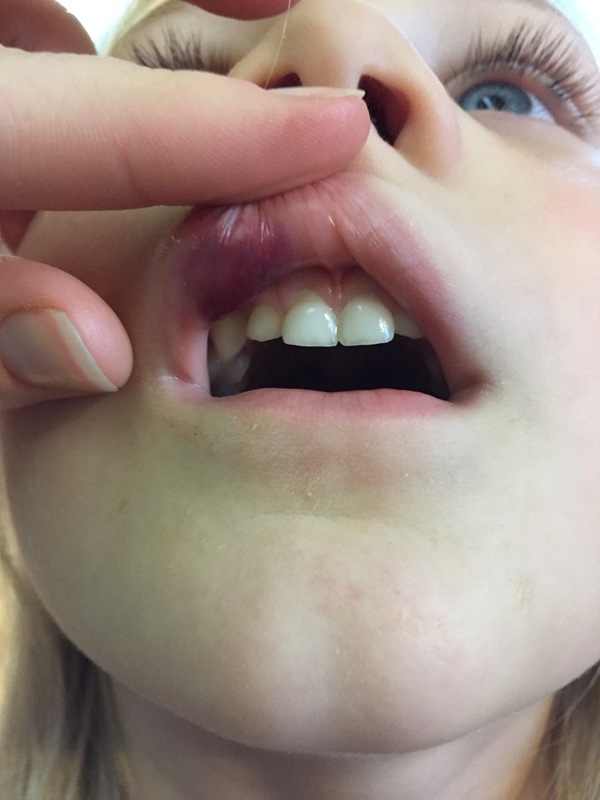 I was actually surprised at how long it took for her tooth to get loose enough to pull – nearly 3 weeks! (It probably could have come out sooner but I was kind of chicken when it came to pulling it. 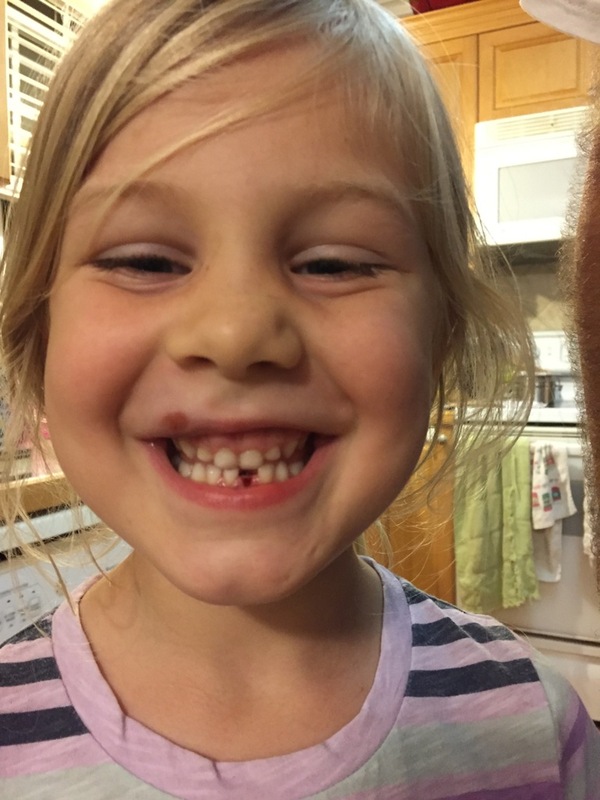 I didn’t want her first loose tooth experience to be totally traumatic and scar everyone for life, myself included.) So last night, she let me wiggle it a little bit more aggressively and I could feel the root sort of crack. We stopped but LB assured me it didn’t hurt, just startled her. So we did it again. And again. And finally on, like, the 4th wiggle, I managed to get her tooth out. And she is so excited, even today. She’s insisting we call her “One Tooth” and keeps coming up and baring her teeth at me in what looks like a rictus of pain but I assume is meant to be a smile. On a super cool note, DB asked her what the Tooth Fairy did with her tooth and all the other kids’ teeth and LB told us that she turns them into stars. I thought that was the coolest theory I’ve heard and certainly beats any ideas I may have had. I’m a lot less nervous about the next 59 teeth we have to get through for all 3 girls now that we’ve had one successful, non-traumatic tooth pulling. Hopefully they all go this smoothly.